Robert Louis Grunthaner, 90, passed away Thursday February 7, 2019, at St. Mary's Hospital in Huntington. 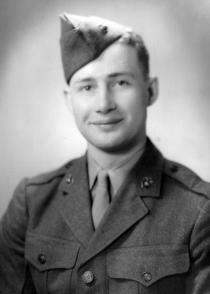 Robert was born September 9, 1928 in St. Mary’s, PA, a son of the late Norbert and Mary (Keller) Grunthaner. His family moved to Buffalo, NY, where he met and married the love of his life, Ellen Bury. Bob was a member of the US Marine Corps stationed at Camp Lejeune in North Carolina when first child Bobby was born. Later the family returned to Buffalo and expanded to include daughters Nancy, Linda, and Marianne. Supported by the GI Bill, Bob pursued higher education and developed a career as a men's clothing buyer for a Buffalo department store. The family relocated to Huntington, WV in 1979, where Bob played a similar role at Stone & Thomas until his retirement in 1995. Throughout their life together, Bob and Ellen returned frequently to North Carolina and the southeast for vacations, with Wilmington and Colonial Williamsburg two favorite destinations that combined their shared love of history and trips to the beach. A loving father, Bob was also an avid gardener and an excellent woodworker. Most of all he was a devoted companion and caregiver to Ellen, who preceded him in passing in 2017. Bob's warmth, optimism, and generosity touched all who knew him, and he will be dearly missed. Bob is survived by three daughters, Nancy Wiemers, who with her husband Robert continues to reside in Bob and Ellen's first home in Buffalo, NY, Linda Adams of Barboursville, WV, and Marianne Grunthaner of Columbus, OH; one son, Robert Grunthaner of Lancaster, NY; three grandchildren, Drew Adams, and Mark and Kerri Affronti; and three great-grandchildren, Will and Thea Adams and Alexandra Affronti. Visitation will be from 6 to 8 p.m. Monday, February 11, 2019 at the Wallace Funeral Home, Barboursville. A Mass of Christian Burial will be conducted at 10 a.m. Tuesday, February 12, 2019 at Sacred Heart Catholic Church, Huntington, by Rev. Fr. Douglas Ondeck. Burial will be in Mount Calvary Cemetery, Buffalo, NY. In lieu of flowers, the family suggests donation be made to the Dominican Nuns of the Monastery of Our Lady of the Rosary, Buffalo, NY: www.opnuns.org/donate. Online condolences may be expressed to the family at www.timeformemory.com/wallace.